Managing Bids, Tenders and Proposals shows suppliers and vendors how they can gain competitive advantage by being more effective and productive when pursuing sales opportunities and competing to win new contracts. Suppliers and vendors can also learn how to identify and reduce delivery risk and commercial risk. Responding to requests-for-tenders (RFTs) and requests-for-proposals (RFPs) is frequently a challenging time for the supplier and vendor bid teams. Within tight timeframes, they must finalise their win strategy, determine their delivery plans and create compelling documentation that responds to the customer's questions and requirements. This essential reference work explores what needs to happen when responding to RFTs and RFPs and explains the essential knowledge needed by the bid teams. In clearly written and well-structured chapters, Managing Bids, Tenders and Proposals addresses everything a bid manager or bid team member needs to know. Understanding profit, pricing, value and risk are essential for competitive pricing and profitable business. How customers manage their procurement programmes drives the lifecycle of a sales opportunity. Sales governance based on objective criteria identifies the right opportunities to pursue. Knowing what to look for in RFPs and RFTs helps to structure powerful bid responses. Understanding contracts, finance and business cases protects the commercial position of the supplier or vendor. Mastering these topics makes bid management a complete discipline that places a premium on leadership and managerial skills. Not only are the fundamentals of bid management captured simply and concisely, Managing Bids, Tenders and Proposals also explains how to plan and manage a bid response. Additional chapters define what makes a bid response compelling, as well as how to write and review bid documents to best position your bid, tender or proposal. 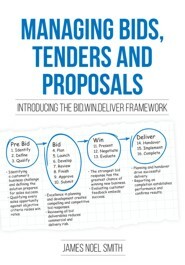 Managing Bids, Tenders and Proposals introduces the Bid.Win.Deliver Framework, a new and unique approach for responding to sales opportunities. In 16 procedural steps, the Bid.Win.Deliver Framework guides bid teams through the development process from identifying a sales opportunity to developing a compelling and competitive bid response. Any supplier or vendor in any industry that submits bids, proposals and tenders will benefit from adopting the Bid.Win.Deliver Framework. The framework provides a clear roadmap for implementing best-practice bid management at suppliers and vendors in any industry or market. The Bid.Win.Deliver Framework equips any professional with the skills to lead and manage a bid response. For experienced bid managers, the Bid.Win.Deliver Framework provides a common reference for discussion, reflection and professional development. James Smith provides a structured, practical guide to winning new business. It combines proven methods and processes with years of experience. Whether you are an experienced professional or a newly developing professional, you will benefit from the insights and guidance found in this valuable book. Bidding takes talent, broad knowledge and individual insights with a hard-working and dedicated bid team tightly co-operating within a structured format to win the hearts and minds of customers. In his book, James Smith digs deep into his own hard-earned experience and shares it generously, adding value to both seasoned veterans and rookies. He puts it all in the end-to-end context needed to become really successful. Not only does he elaborate the “Why” but also spells out the “How”. James, who I have enjoyed knowing and working with for a long time, is a true subject matter expert and this book will be very useful as a tutorial or reference for all involved in the production of major bids. I whole-heartedly recommend it.